Irene Maciejewski, 84, of N Holden Street in Port Washington died Sunday, November 21, 2010 at Aurora Medical Center in Grafton, Wisconsin. She was born July 9, 1926 in Milwaukee, Wisconsin to Michael and Veronica “Winnie” Grabowski. She grew up in Milwaukee and married Celestyn Maciejewski of Welhaven, Wisconsin September 6, 1947 in Milwaukee. They moved to Saukville in 1969 to run Cel’s Bar & Grill (currently Wagen’s) and lived upstairs raising the family. In 1977 they moved to Port Washington . 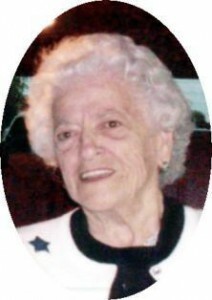 She was a proud homemaker, avid babysitter, seamstress and enjoyed knitting and crocheting. She was also a great baker, referee and was proficient at dishwashing. Irene is survived by her husband of 63 years Celestyn and children Sharon (Milt) Rennicke of West Bend, Dwight (Joanne) Maciejewski of Port Washington, Kevin (Olga) Maciejewski of Fountain Hills, Arizona, Lynn (David) DeBroux of Menomonee Falls, Lois Ebert of Port Washington, Neal (Heidi) Maciejewski of the Town of Grafton and Sandy (Dennis) Carroll of Port Washington. Further survived by 13 grandchildren, 7 great grandchildren, sister Shirley (Morgan) Robinson of Cudahy, nieces, nephews, other reltives and friends. Preceded by an infant daughter Mary, infant son Keith, her parents, parents-in-law Stanley & Helen Maciejewski, 2 brothers Lawrence & Gordon Krumrai and granddaughter Ana Rose. Rev. Patrick Wendt will celebrate Mass Of Christian Burial at 12 Noon on Friday, November 26, 2010 at St. Peter of Alcantara Catholic Church, 1802 N Wisconsin Street, Port Washington. Visitation 10 am – Noon Friday at church. The rosary will be prayed at 10 am. Entombment St. Mary’s Cemetery, Port Washington. Memorials to the American Cancer Society appreciated.